I have always loved the idea of rooftop gardens, it’s a great way to allow people at home or who run a business to still be able to have the opportunity of being as self sufficient as possible without having to leave the comfort and facilities of a city. So when I heard that Grow 40 had opened, I was pretty excited about it and very keen to get down and have a look. Chef and co owner Mickael previously worked for The Pig Hotel in The New Forest where they forage and grow all ingredients for their menu and that’s he acquired his green thumb and love for homegrown food. 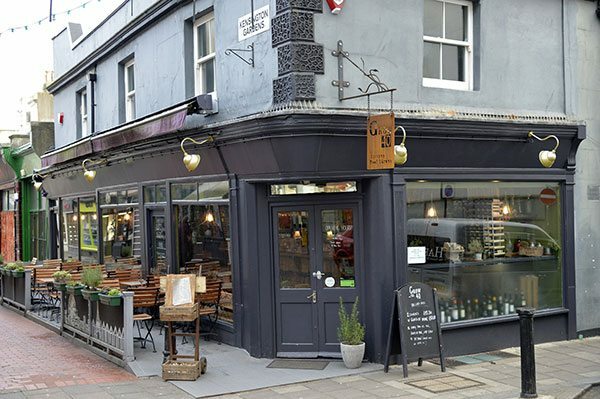 Pairing up with a lovely wine list and excellent knowledge, this is a new and exciting venue that I am sure is going to do well and offer something quite unique. I met a friend here quite late on a mid week evening. The restaurant was busy downstairs but we were offered to sit upstairs where it was a little quieter and only one other table of customers to share with at that time. The venue was formerly Cafe Delice, on the corner of Kensington Gardens opposite Infinity Foods. From the outside, Grow 40 looks attractive and appealing, with wooden interior, mood lighting and a warming and inviting feel. They have done a great job of the design and it is definitely a comfortable place to enjoy a wine or meal in the evening. Upstairs it is a little more intimate, with dim lighting (a little too dim for my camera that evening), but if you aren’t there to take pictures of the food then it’s a lovely setting. They have a wine snug for members only, which they have limited spaces available, and they have special deals each month for the members to benefit from. It does look pretty cosy in there, with old, comfy armchairs and seating, it tempted me to join just so I can come and hang out in there in the evenings. We were offered a wine to start with, and as I felt like a red we decided to go for a carafe to share of a Spanish Tempranillo. We were given the wine by the glass menu to look at, where they have around 6 reds, 6 whites and a couple of sparklings to choose from, all of which you can have either 175ml, 250ml or a carafe. 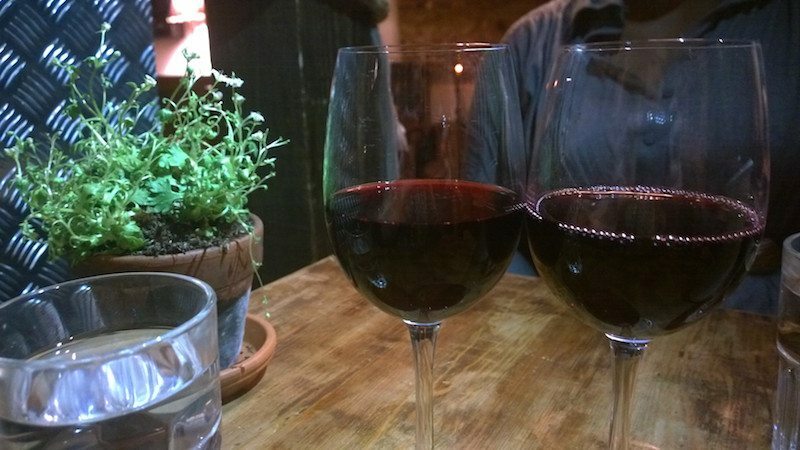 They do have over 200 different wines to choose from at all times if you would like to share a bottle, so make sure you ask their in house sommelier for their best recommendation to suit your meal. The food menu is nice and small, with just a small handful of starter and mains to choose from, but enough of a range to have something for everyone. Mickael the owner was serving us this evening, as they had a last minute staff illness and were unexpectedly busy downstairs. We ordered our dishes and sat back to catch up and enjoy our wine. Our starters came out after a little wait, we knew they were busy so we weren’t expecting them to come out too quickly. I had ordered the goose rillette with homemade pickles, and my friend went for the lemongrass razor clams which looked lovely. 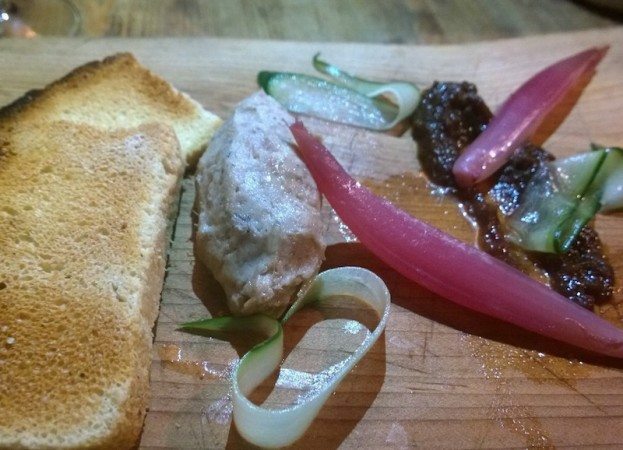 My rillette was served on a wooden board (plank haters beware), and with pretty pickled pink shallots and crunchy bread. The menu stated the bread was a homegrown rosemary focaccia, but I didn’t see a fleck of rosemary in it, and it didn’t look like focaccia either so I am guessing they were out of it that evening. The rillette was thick and lovely, and went well with the sharp pickled shallots and chutney on the board. 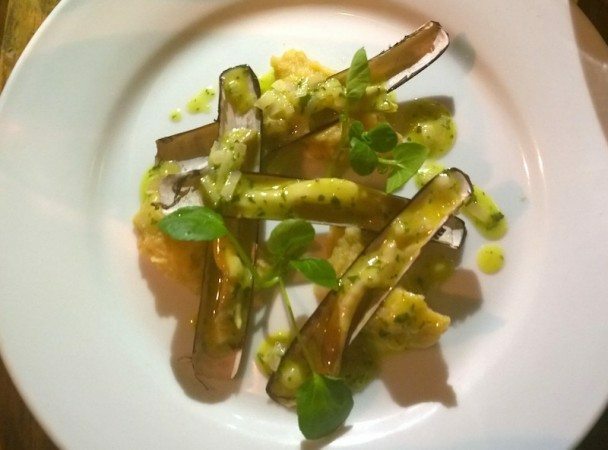 My friend’s razor clams had a delicious flavour, with lemongrass crystals and a lovely sweet parsnip puree. We finished our starters and our plates were cleared away swiftly, despite the busy restaurant downstairs. Our mains were brought up shortly after which was good because I was super hungry! I had splashed out and ordered the steak, and my friend stuck with the seafood theme and ordered the seared turbot. 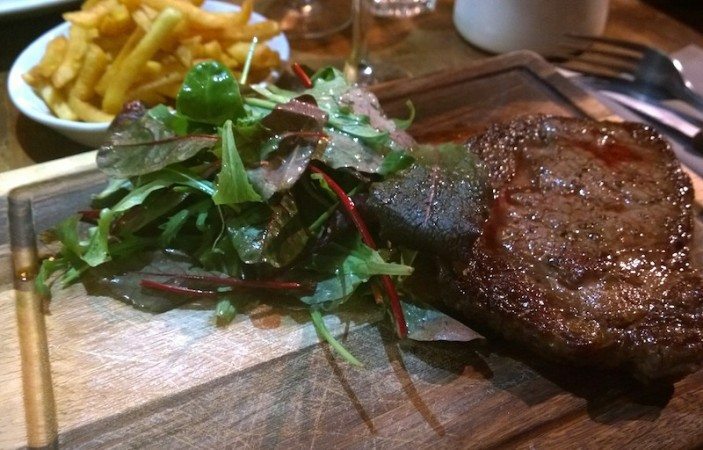 The steak again was served on a wooden board, and comes with a small side salad, so I ordered some chips as well to go on the side. 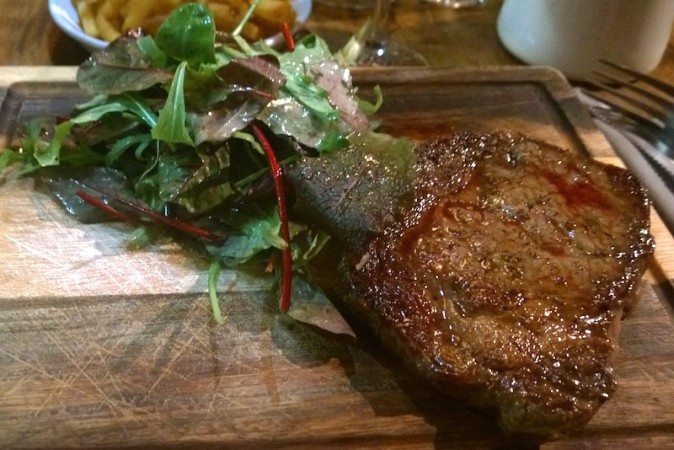 The steak is a rib eye cut, and has been aged for 20 days and is reared on a farm in Hampshire near the New Forest. I asked for it to be cooked rare, which it was perfectly. It was very well seasoned, and represented excellent flavour that you would expect from well reared and hung meat. The salad was lovely and fresh, and lightly dressed, and the chips were well cooked and crispy, although not hand cut which is my preference! 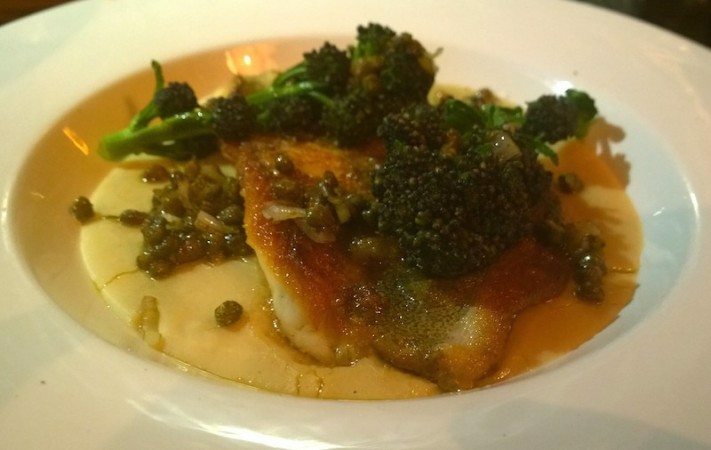 My friend’s turbot was delicious, it was just cooked, with a crispy skin, and came served on a smoked garlic and borlotti bean puree and smothered with a lemon butter and a side of purple sprouting broccoli. After our mains were were feeling more full, but still felt we had room for dessert. Mickael brought us up the dessert menu, and we were both looking forward to trying some of the different choices. I decided to go for the rice pudding, as I hadn’t had a good rice pudding for years, while my friend went for the dark chocolate and chilli fondant that sounded delish. 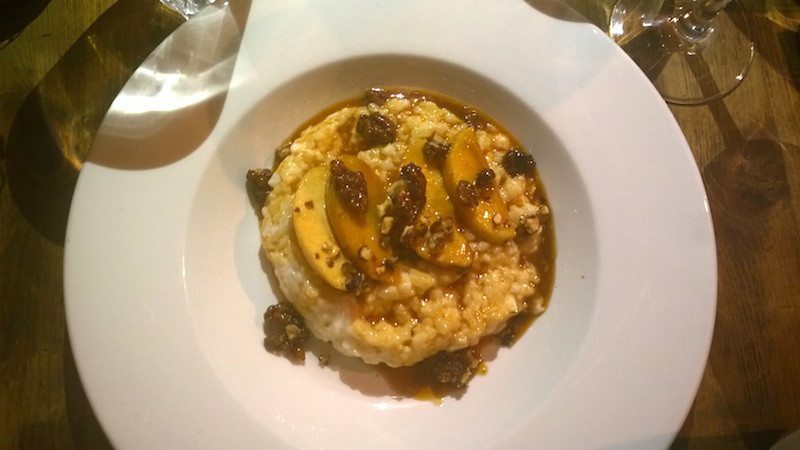 The rice pudding came with candied apples and sultanas, and was nice and creamy and sweet. The fondant had a slight kick to it, but not overpowering on the chilli, and was nice and rich but a little overcooked so it wasn’t runny in the middle to my friend’s disappointment. It came with a sweet toffee sauce that tasted like sweetened condensed milk, but was delicious none the less! Mickael came upstairs with another plate for us, that had 3 little sweetcorn cakes on it topped with yoghurt ice cream and salted toffee popcorn. I had looked at this on the menu but it did sound a little strange so I had gone for the safer option! Boy was I wrong, as these were amazing! Mickael said that they were his creation which had came about by accident when he had gone to make sweetcorn cakes and had forgotten the flour one day. They are made using pureed sweetcorn and a little sugar and salt, and have a lovely moist texture and interesting but incredibly more ish flavour! 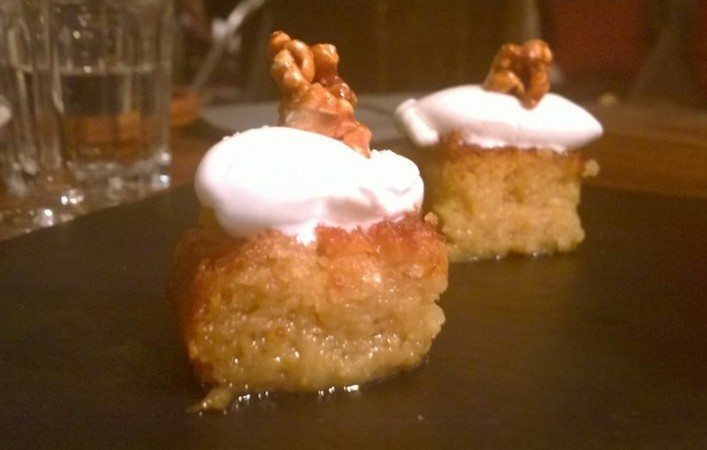 They were topped with a cooling yoghurt ice cream and a piece of salted toffee popcorn, which all came together nicely and was very tasty. This dish was the highlight of the evening for both of us, and we were very grateful that Mickael shared it with us too. After a long evening, we were both shattered but feeling happy and full with our new find. It was great to meet and chat with Mickael, as I really love what they are doing there, and I am looking forward to seeing what they will be doing with the place in the near future.